Do you want to feel more comfortable driving your Motorhome, Trailer or 5th Wheel? or have the time or patience to teach them? Then Gold Country RV Driving School is for you! With over 35 years of combined experience our RV driving training course features hands-on instructions from hook up to set up, for your motorhome, 5th wheel, travel trailer or other towables. Our goal is for your experience to be both enjoyable and educating, while making you a proficient and confident Rv’er. 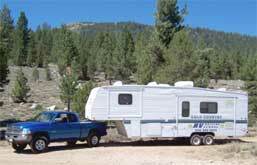 Gold Country RV Driving School is prepared to teach you how to handle your RV with our 10 point lesson plan for motorhomes, travel trailers, 5th wheels, toybox trailers, car trailers, boats or anything in between. We accomplish this through private lessons, using your RV, starting in your own driveway or with mini seminar training sessions. » For lessons in Northern California within a 50 mile radius of Sacramento, we'll start your lessons in your own driveway, using your RV, at no additional cost. Lessons outside the 50 mile radius of Sacramento, you have the option of either coming to our location or, for an adjusted cost to cover additional expenses; we will come to you. » Single Person - 8 hours - One Day - 10 point Lesson Plan. 12 hours - Two Days - 10 Point Lesson Plan. » Two Persons - 2 Days - 6 hours. Student manual included with lesson for your own notes and future reference.